L-Carnitine Complex by TREC is a dietary supplement, which is composed of L-carnitine tartrate, vitamin B6 and chromium. These substances support metabolism of proteins, carbohydrates and fats. It allows to obtain efficient energy production and deriving maximal benefits resulting from proper metabolism of macroelements. L-carnitine tartrate - is a molecule built of the complex of carnitine and tartaric acid. An additive of this acid stabilizes the amino acid, which is naturally synthesized in the liver, kidneys and brain from lysine and methionine. Carnitine is an amino acid, which is naturally synthesized in the liver, kidneys and the brain from lysine and methionine. It is responsible in the organism for the support of energy metabolism and the protection of mitochondria from the negative effects of aging. The main macroelement, this substance has influence on is fat. The complex carnitine-fat is transported to mitochondria by means of CPT1 and CPT2 transporters. It facilitates providing high-energy fatty compound from these organelles, where they serve as a substrate for energy production. Thanks to such an effect, carnitine also facilitates the process of fat reduction. This amino acid may stimulate the production of energy, also in an indirect way. It results from the fact that maintaining its proper level in the organism, increases the amount and size of mitochondria. It is an effect, called anti-aging effect, as the reduction of the amount of these organelles is observed with age. Vitamin B6 in the form of pyridoxine hydrochloride is the compound which facilitates metabolism of amino acids in the organism. Pyridoxine hydrochloride, after the absorption, is converted in the liver and intestines to the active form - Pyridoxal 5′-Phosphate. This compound is engaged in the process of glycogen phosphorylation, which consists in facilitating the decoupling of glycose molecules from glycogen reserves. Thanks to such an effect, availability of glucose for molecules which may use it in energy production is increased. Chromium is a very important mineral, which is mainly engaged it carbohydrate metabolism. Its main reservoir in the organism is chromodulin. It is a protein, which modulates the signal transmitted by insulin receptors. The mechanism of this effect consists in the fact that chromodulin, after binding with the insulin receptor present on the surface of a cell, facilitates its permeation to its inside. It reduces its total amount on the surface of cells, which is an important factor regulating insulin sensitivity of the organism. It not only improves carbohydrate metabolism, but it also protects from the development of diabetes type II. 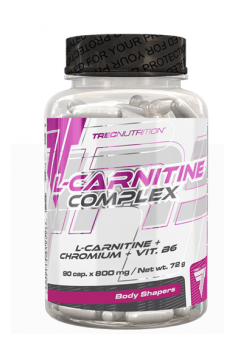 L-Carnitine Complex by TREC is the preparation, which is composed of the substances, which support metabolism of the basic macroelements in the diet. Thanks to such an effect, the supplement facilitates energy synthesis in the organism and ensures proper utilization of food ingredients. The preparation is addressed to active people, as its ingredients effectively improve work effectiveness of the organism. The activity of carnitine also enables more efficient fat burning, which is especially important for people during weight loss. Take 2 capsules 30 minutes before exercise. Take one twice a day 30 minutes before meal. Increasing a daily dose enables maximization of effects related to the application of the ingredients contained in the supplement. They are completely safe, therefore, using higher doses is not related to the appearance of stronger side-effects. Additional supplementation with magnesium has synergistic effect with vitamin B6. It allows to mollify nerves and muscles in the organism. The supplement is worth applying close to fatty and carbohydrate meals, as its ingredients facilitate metabolism of these macroelements. Maltodextrin; capsule shell (gelatin, dye - titanium dioxide, azorubine); anti-caking agent - magnesium salts of fatty acids. A complex of B group vitamins. They increase energy, helps concentration and promotes metabolism.